When Eric Eagan of #TrailsRoc invited me back to run the 0SPF 1/2 marathon trail race in Victor New York it didn’t take much twisting of my arm. I had a great time last year – the trails are well-maintained, the terrain offers a little bit of everything, and the race crew and volunteers make you feel like family. And yes, when you can go to The Red Fern in Rochester for a post-race meal…it’s a no-brainer! This year fellow Strong Hearts Vegan Power teammate Sean Scott joined me which was an added bonus! Last year I was able to take the win and a new course record after racing the 2 previous weekends. I was fully prepared to beat last year’s time – this year I had almost a full month off from racing and with this race falling in the middle of a new build phase I was feeling strong! Perhaps I felt too confident because I failed to focus on some key components. So the race turned into a humbling experience – one that is needed from time to time to remind you that races don’t always go as planned, even when you go into it feeling 100%. In fact, when the race started I still didn’t think I would have an issue. Talk about being over-confident! In the first mile I was feeling overheated but we were also exposed to the sun for most of it and I knew soon enough I would be in the shelter of the trees, settled into my pace, and my body would calm down. By mile 2 my face felt very flushed and my head was throbbing like it was going to explode. Mile 3 came and I had to succumb to walking runnable hills – not because my legs were failing me but because running up them caused my temps to soar even higher. I was stepping off to let people pass me by this point – there was a lot of single track and I felt bad holding people back. I played my usual game when things aren’t going well and convinced myself that I would reach a point where things would improve and I would feel like myself again. My first point was 3 miles but obviously that had passed with no improvement. I then told myself that after the turnaround I would feel great and negative split the race. Okay, sometimes the self-talk can be a little too far-fetched 😉 I was able to hit the turn-around still in 2nd place but the next few females were not far behind. Hitting those hills on the return I was close to crawling – I actually doubted my ability to walk up the steep ones as I was feeling a little dizzy. I filled my Inov-8 Race Ultra Vest with 1.5 liters of water thinking this would be more than enough for 2 hours of racing but it was draining quick. There were aid stations on the course but they did not provide cups (and the racers were well aware of this – thank you #TrailsRoc for avoiding unneccessary waste!) I knew that with my pack I would not need to stop for water but I now realize that in hot races I rely on dumping water over my head at every opportunity. I could have very easily packed my collapsible cup provided to all athletes at the Vegan Power 50k and solved this problem very easily. Another lesson learned! I arrived at an aid station and the wonderful volunteers offered ice. I didn’t have to think twice about stopping for some! They were kind enough to shove a huge chunk down the front of my shirt and it felt amazing. At this point I was walking and jogging whenever I felt the urge. My GPS sounded off the 9 mile mark and I laughed at how much further I still had to go at this pace. Yes I laughed – at this point I was totally fine with how my day was going. No one ever wants to have a bad race but once it goes wrong there is nothing left to do but chalk it up as another learning experience! My finishing time was over 15 minutes slower than last year. That’s over a minute per mile slower! OOF! Not a total loss though because I finished the race (in 5th place), I got to enjoy the company of some awesome runners, and you better believe I still had that post-race meal at The Red Fern – rainbow sprinkle donut sundae and all 🙂 And it snapped me back into race mode – or more importantly race preparation mode. With Escarpment coming up this weekend you better believe I am prepping for heat and humidity! 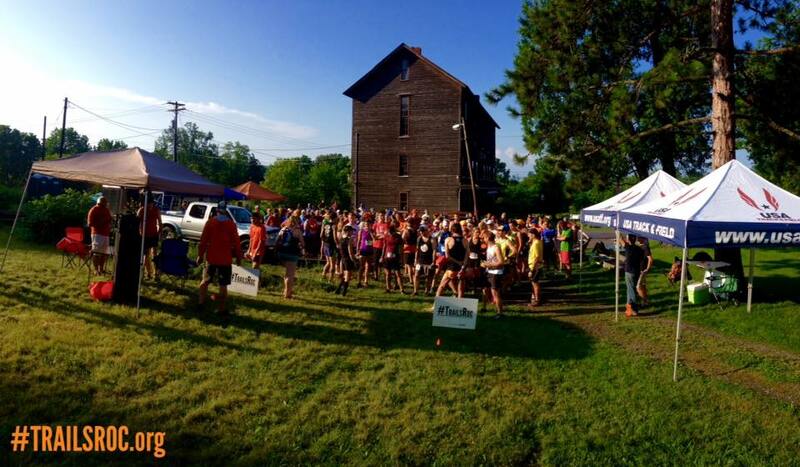 Thanks again to Eric Eagan and the #TrailsRoc crew for inviting me and hosting a top-notch event! If you are not familiar with this group – check them out! They are a non-profit organization promoting trail running, maintenance and preservation. The proceeds from their events support the maintenance of trails and their conservation efforts – a worthy cause to all of us. And of course…here’s your race video to learn more about the group and the event! This entry was posted in race, race report, trail race, trail running and tagged #TrailsRoc, 0SPF. 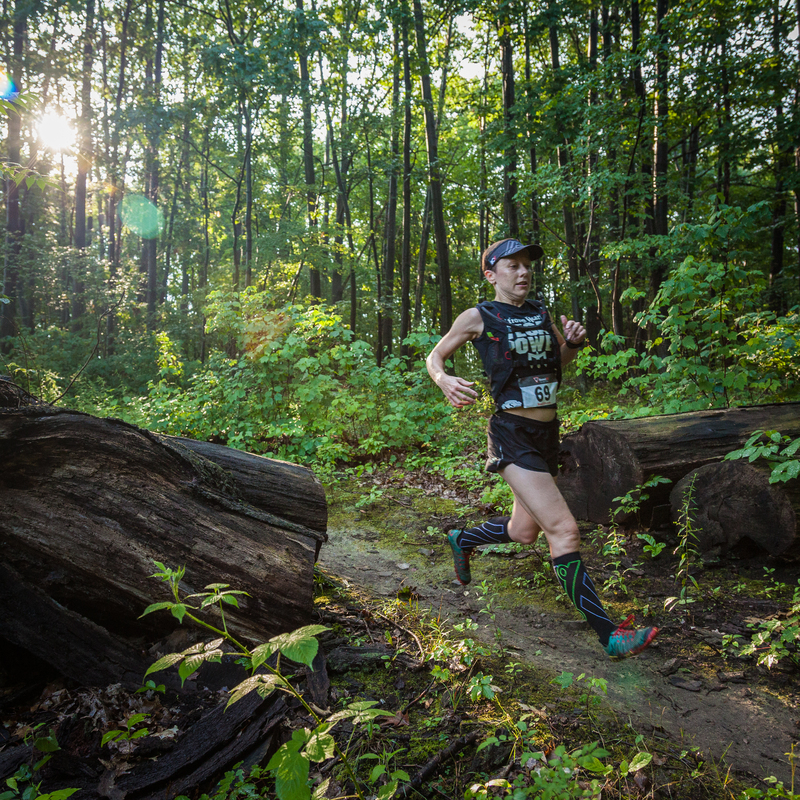 The Red Fern, 110%, inov-8, race, race report, race ultra vest, racing, Strong Hearts Vegan Power, strongheartsrun, trail racing, trail running, trailroc 150, Vegan Power by lljkline. Bookmark the permalink.